The Maine People’s Alliance today called on Governor Paul LePage to return a contribution to his election campaign from Logisticare, the Atlanta-based private broker that was given a $5.1 million contract to handle the MaineCare rides program in York County in August of last year and has since been engulfed in controversy for missed rides, a breakdown of the volunteer system they were meant to manage and other serious complaints. Logisticare Solutions LLC gave a $1,500 contribution to LePage’s campaign on September 13, 2013, just as his administration and the Legislature’s Health and Human Services Committee were scrambling to evaluate the company’s performance and find solutions to a flood of complaints about missed rides, long waits and unanswered calls. Both Logisticare and fellow broker Coordinated Transportation Solutions (CTS), which has a larger contract covering most other counties in the state, were found to be falling far short of their obligations to patients. In 2010, before winning the York County contract, Logisticare also gave an undisclosed amount to the account of the organization that oversaw LePage’s transition and which would later be renamed Maine People Before Politics and serve as LePage’s personal interest group. The problems with Logisticare have continued over the last few months. 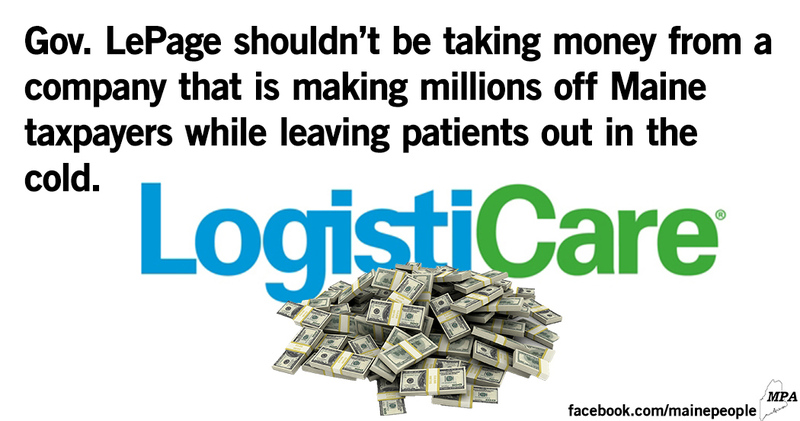 In December, York County Community Action (YCCA), whose volunteers currently provide the majority of the rides in Logisticare’s contract area, announced they will have to shut down their transportation program due to the decreased reimbursement rates and increased administrative overhead since Logisticare’s takeover. YCCA had previously operated the entire rides program in York County, with far fewer complaints, for $1.3 million less than what the state now pays Logisticare. This week, Anita LaRose of the York County Shelters Program wrote to the Health and Human Services Committee about ongoing issues with Logisticare. She told the story of a young mother with a toddler and a newborn who was attempting to obtain transportation to a postnatal doctor’s appointment, but couldn’t get a ride even after her doctor and shelter staff called Logisticare to advocate on her behalf. While the LePage administration has announced that they will not renew the contract with CTS, they have not taken similar action with Logisticare and instead announced last week that they will consider allowing Logisticare to take over CTS’s contracts. A work session will be held this afternoon on LD 1636, a bill proposed by Senator Colleen Lachowicz to end the contracts with Logisticare and CTS and move the state away from a private rides broker system.